Above: The pond on ul. Pozytywki. 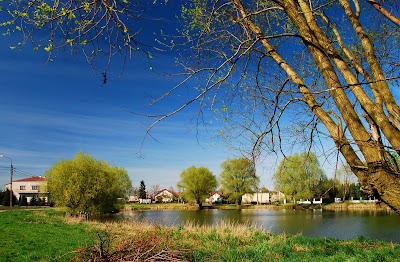 Trees are coming into leaf, grass turning very green all of a sudden. Right: The field that runs parallel to ul. Nawłocka furrowed like corduroy. 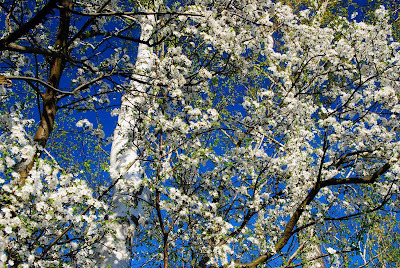 Apple trees in blossom and a clear blue sky add to the spring atmosphere. 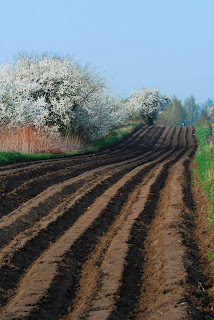 We are entering the most beautiful time of the year in Poland - the ten weeks between now and the end of June. Plenty of sunshine, drier than July or August. Click on the ul. Nawłocka label (below) for more views along this road. Left: Ul. 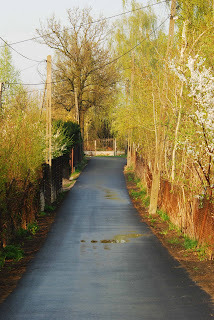 Dumki has received a layer of brand new asphalt. Householders living here can now get to and from their homes without having to go axle deep in mud. The asphalt may be new, but the road itself was hardened in June 2007 (residents had to wait nearly two years for the job to be finished). Click on the ul. Dumki label (below) for more views along this road. Below: Blossom and birch bark against a blue sky.